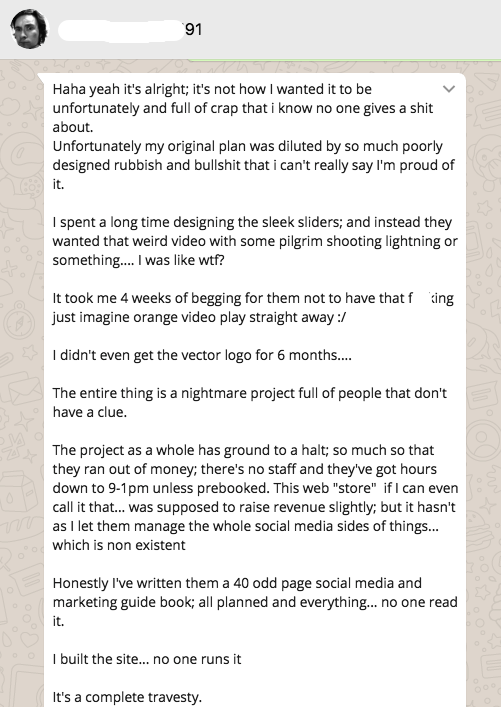 I was recently asked by someone from the Project to explain why I was so vexed with what they are doing. I replied it was less being vexed and more a case of trying to balance the Project’s misinformation. But now, now I guess you could call me slightly vexed. I try to stay impartial and objective with this blog and not let any personal feelings interfere with what I write here. So I’m apologising in advance for more of a personal blog than I usually write, and for what is basically a bit of a rant. But I feel that I need to speak out so as not to not allow myself to be taken advantage of. The HMP have a “new” website which they are currently trumpeting, and is credited as the work of “GSL”. I’ve tried to keep this post as short and concise as I can, so please bear with me. I have also had to include various messages here as proof of what transpired, in the knowledge that the HMP may try to say different, or say they “didn’t know”. I had put several of HMP’s images in the header and added paragraphs about the Project and what it was doing. I altered several of the areas and made them appropriate to the Project. I explained that it could be further enhanced by various plugins that could for example have tabbed browsing and even a shop. My idea was that this would be a more modern looking site and as it was all on one scrolling page, very straightforward and easy to navigate. At this time there was a young man called Greg helping at the project. Greg is a friend of Mr Sean Day (staff) and still visits the Project today, he’s very IT savvy and keen to learn. I asked if he’d like to help me with the new website as he’d learn something about web design and how to use a WordPress template, things that might be handy to know. So I explained how it worked and he helped get the demo up and running. A little while later the full demo with HMP material added was shown to the HMP who liked it but eventually decided not to go with it. That wasn’t a problem, and a little while later I moved out of Harwich and back to London, leaving the Project behind. I then received a mail once I no longer helped out, mentioning the demo. This again acknowledges the Project is aware of the site I prepared…. Sean was with Gregory and I when I asked for the login [for the demo]. I would very much like to see the Mayflower Demo site – and that is why I asked Gregory for those login details – unless you have another way of showing it to me online? Over the last few months I have been working with [Greg] on a demo of a website which we believe would be a huge improvement on the current Harwich Mayflower site, in fact everyone who has seen it (including Mr. Day) has said that it is a fabulous achievement and a major improvement over what the Project currently has. In my professional opinion (as CEO of a server management and website design/hosting company with over 14 years experience) the current HMP site does nothing to promote the Project. The same must also be said for the Project’s social media output which to be honest, is lacklustre and amateurish at best. I’m sure you will be aware of the positive impact a well designed website and managed social media can have on a company. You will also appreciate that a poorly managed media output will have a significantly negative impact on the same company. From a recent conversation I had with [Greg] it would seem that you have asked for details of the new ‘Frame’. I’m assuming this refers to the ‘Mayflower Demo’ project which [Greg] and myself are working on. The demo which we have put together is an example of our work and is not in the public domain. It is to be used to show what we can do for the Project and to enlighten the Project as to how our work is a major improvement on what you have at the moment. …looking at the demo this is already much better than previous. Now, fast forward 2 years and the Project unveils a “New” site by GSL. Imagine my surprise when I realised the website is using the SouthCentral template I originally submitted and is basically a photocopy of what I had worked on and shown as a demo in 2015. All that has been updated is the news and images, which I guess is to be expected after two years. 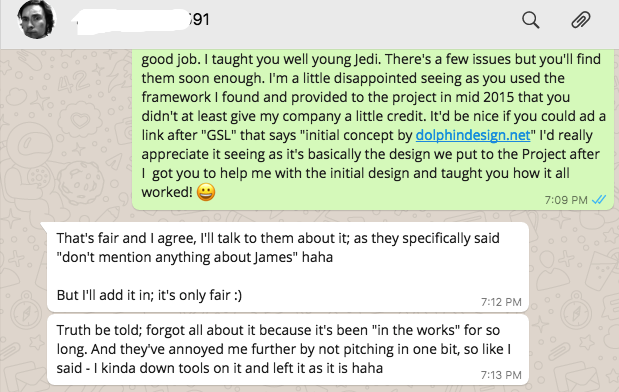 I contacted Greg and asked about the site… [images can be clicked on to enlarge] This is confirmation that I did indeed work on the demo site and it was the basis for the “new’ site. Yep it IS only fair. “Don’t mention anything about James”? Wow, Really? well if nothing else, it’s proof that the Project admits it knew I worked on the site but wanted to keep my name out of it. The following is confirmation that Greg is indeed the “GSL” that worked on this “New” site. In a nutshell, I supplied the canvas, the brushes, a paint by numbers picture and explained how to do the painting, then someone came along, bought their own canvas, copied my picture, put a splotch of colour on my work and called it their own while protesting “But I bought my own canvas!” I did ask for a credit, but in all honesty I think there’s more chance of the Harwich Mayflower Project building a ship. I’d rather just let people know how this “new” site came into being. If nothing else, this has taught me two things. Greg is easily led and somewhat naive, and the Project’s ideals don’t seem to have changed since I moved on. I have contacted Greg and asked for some form of credit on the site, but after a week of asking, that request has been ignored. Of course, the basic template is freely available to purchase by anyone to do what they want with, including the Project, and it was purchased. But ownership of a template isn’t the issue here. The issue is that without using my knowledge, input, ideas and work on the demo, there would be no new site. They wouldn’t even know about this template, never mind how to set the thing up. They could have used a different template, or coded their own site from scratch, but they went down the easier route of using what I had previously given them. So a thank you and a small credit would’ve been appreciated. Too much to ask? I think not. Again, apologies for what is more of a personal post than usual.